A Chicago sports memorabilia collector had the Cubs’ Kris Bryant’s cleats tested by a forensics firm—with “divine” results. Restaurateur Grant DePorter said he paid $35,000 for the shoes Bryant wore during the victorious Game 7 of the World Series—but an affinity for forensics lead him to get the dirt in the cleats tested. The results were nothing if not coincidental. “I thought that was a very spiritual moment, that last out—and his smile,” DePorter told NBC 5. With all the talk of curses, DePorter said he believed fate played a large part in quenching the 108 year drought for the Cubs. 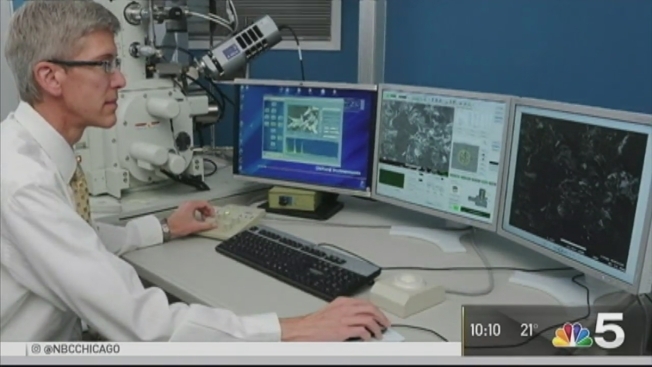 Last December, DePorter sent the dirt to a material analysis lab for image magnification. At the microscopic level, DePorter says he found what he was looking for. "Grant recognized a likeness to Harry Caray in one of the images and was convinced there must be more 'divine intervention' related to the Cubs in the dirt samples," said David Wiley, president of McCrone Associates, Inc. "Upon further examination of the dirt samples in the scanning electron microscope, the 'C' and the bear head profile likenesses were also found." “To me it was painfully obvious, you see Harry, you got his glasses, got his mouth, his cheeks, his nose,” he said, holding up the magnified picture of dirt next to an image of legendary sportscaster. He also claims, at a zoom factor of 1870 (the year of the team’s birth), one can make out the “C” for Cubs. Another image amplification shows a Cubby Bear face. “I believe in signs and I think that this is just Harry showing his sign that he was there for that final out,” DePorter said. The memorabilia DePorter recently purchased will be on display at Harry Caray’s Tavern at Navy Pier and then the Chicago Sports Museum.